Fixing or changing the internal workings of the framework. Installation packages are available on the S3A Software download page. 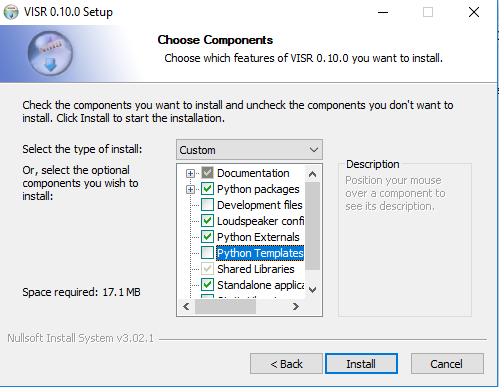 If you plan to use the Python integration of the VISR framework (see Python integration), you need to select an installation package matching the Python version you are using, for example VISR-X.X.X-python36-Windows.exe. The graphical installer is provides as an .exe file and provides a dialog-based, component-enables installation. Figure figure_windows_installer shows the component selection dialog of the installer. The choices are detailed below in section Installation components. An executable installer (.exe) with a graphical user interface and corresponding uninstall functionality. Supported are 64-bit versions of Windows. If required, install the “Microsoft Visual C++ Redistributable for Visual Studio 2017”, package, for example from the Visual C++ downloads page. On Windows, it is necessary to add the directory containing the VISR libraries (DLLs) as well as the directory containing third-party libraries shipped with the VISR installer to the PATH variable. To this end, open the environment variable editor (Settings -> System -> Advanced system settings -> Environment variables). 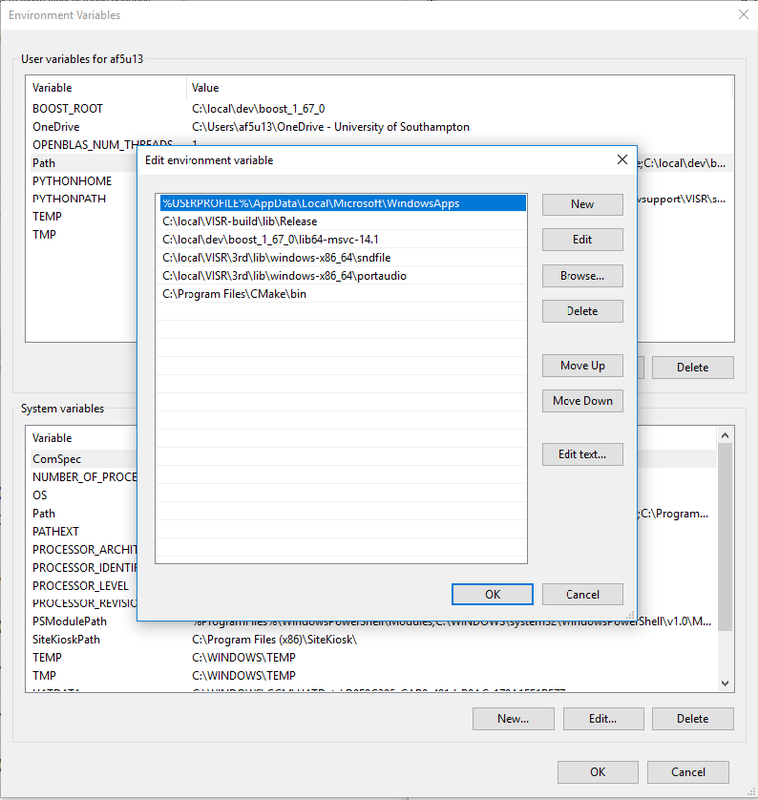 The environment variable on Windows 10 is depicted in figure windows_environment_variables_editor . Environment variable editor on Windows 10. Append the value C:\Program Files\VISR-X.X.X\lib;C:\Program Files\VISR-X.X.X\3rd if the standard installation location was used (Note: Replace X.X.X with the actual version number of VISR). Depending on your system permissions and whether you VISR shall be used by all users of the computer, you can either set the PATH user variable or the PATH system variable. Any applications used to access VISR (for example command line terminals, Python development environments, or DAWs) must be closed and reopened before the changed paths take effect. Append the path ‘’<install-directory>/lib’’ to the path variable, where ‘’install_diectory’’ is the directory specified during the installation. For the default path, the setting would be c:\Program Files\VISR-N.N.N\lib, where N.N.N is replaced by the actual version number. If the PATH variable is edited as a string, subsequent paths are separated by semicolons. Future versions of the installer might adjust the paths automatically. However, as pointed out in NSIS Path manipulation, this needs an extremely cautious implementation to avoid potential damage to users’ systems. To use standalone applications (see section Using standalone applications), it may be useful to add the bin/ directory to the user or system path. For the default installation location, add c:\Program Files\VISR-N.N.N\bin to the %PATH% environment variable. An installer with a graphical user interface guides through the installation process and allows the selection of optional components. Figure Component-based installer for Mac OS X. shows a screenshot of this installer. By default, it installs the VISR into the directory /Applications/VISR-X.X.X/ where X.X.X denotes the version number. Component-based installer for Mac OS X. “Installation type” screen of Mac OS X installer. Use “Customize” to get to the component selection. to the file $HOME/\.bash_profile. However, this works only for running standalone applications from a shell (i.e., a terminal window). If you need this path also from applications that are not started from a shell, we recommend the solution used in section Configuration. After that the framework is ready to use. With the dialog-based, component-enabled installers, parts of the framework can be chosen depending on the intended use of the framework. The core VISR libraries. This component is mandatory and cannot be unselected. Renderers and small tools to be run as command-line applications. Python modules that give access to the functionality of the framework from Python. Also needed to run applications that use Python internally (e.g., the binaural synthesis toolkit or metadapter-enabled rendering). VISR extensions implemented in Python. This group of components requires the component “Python externals”. Header files and CMake build support - Needed to extend the VISR with components using C++ or use the framework in external C++ applications. A set of standard loudspeaker configuration files and additional example files from actual locations. A set of commented template files for different types of VISR components. User and code reference documentation as PDF documents. The Doxygen code documentation covering the complete source code can be optionally selected. However, the latter documentation is deprecated and will be contained in the code reference documentation in the future. Using the framework interactively from a Python interpreter. Using application that use Python internally, for instance the Binaural Synthesis Toolkit or metadata adaptation processes using the metadapter. Creating new signal flows or algorithms in Python. To use these functionalities, a Python 3 distribution must be installed on the computer, and some configuration steps are required. Use the system-provided Python3 installation. We recommend Anaconda. Please make sure you install the Python3 / 64-Bit variant. Some Mac OS variants (for example 10.12) come with a pre-installed Python 3 variant in /Library/Frameworks/Python.framework. In this case, care must be taken that it does not interferes with the chosen Python distribution. In particular, the PYTHONHOME environment variable must be set correctly. Two environment variables must be set to ensure the working of the VISR Python subsystem. PYTHONPATH This variable is used to add the directory containing the VISR python modules to the system path. To this end, the python/ subdirectory of the installation folder must be added to PYTHONPATH. However, we recommend setting PYTHONPATH and assume this in the examples throughout this document. This variable is needed to locate the files and libraries of the Python distribution. This is especially important if there are more than one distributions on the system, most often on Mac OS X. Strictly speaking, this variable is required only if VISR Python code is executed from a C++ application, for instance some DAW plugins, python_runner standalone application (section ?? ), or the visr_renderer with metadata processing enabled. (see section VISR object-based loudspeaker renderer). It is necessary to check whether these settings match with your directory layout. can be used to retrieve the required value for PYTHONHOME On Linux, setting PYTHONHOME is not necessary in most cases, because there is only the system-provided Python installation available. This setting is optional. However, if you encounter excessive processor loads, for example a constant 100% load in the real-time thread, this setting can help to resolve the problem. Note that if there is already a PYTHONPATH variable, the recommended value should be appended, using a semicolon as a separator. In order to set the environment variables system-wide, without requiring that the applications in question is started from a shell, (e.g., a command-line terminal), we recommend a custom launchd property list file, as detailed, e.g., in this StackExchange thread. For convenience, the installers create a pre-configured VISR-X.X.X.plist file in the etc subdirectory of the installation directory (e.g., /Applications/VISR-X.X.X/etc/VISR-X.X.X.plist ). This file can be either loaded directly or copied to the LaunchAgents/ directory first. Please check the values in this file first and adjust them accordingly. To take effect, all applications using these settings (e.g., terminals, Python interpreters, DAWs) must be quit and reopened. If you made changes to the settings, you have to perform the unload command followed by a load. We suggest some basic tests to verify that the VISR framework has been correctly installed and configured. This test is to ensure that that the installation is successful, and that the VISR shared libraries can be located and are compatible with the system. When using the component-enabled installers, the component Standalone applications must have been selected in order to perform this check. Note that the quotes are necessary to cope with the space in the path. If there is an error message about a missing shared library (or DLL), you should consult the respective section about installation. In particular this applies Windows, where the PATH variable needs to be set accordingly. This test ensures that the VISR framework can be used interactively from Python interpreters. First start a Python 3 interpreter (for example python or ipython). Depending on the system, the binaries might be called python3 or ipython3, respectively It must be the interpreter of the Python distribution you intend to use (e.g., Anaconda). 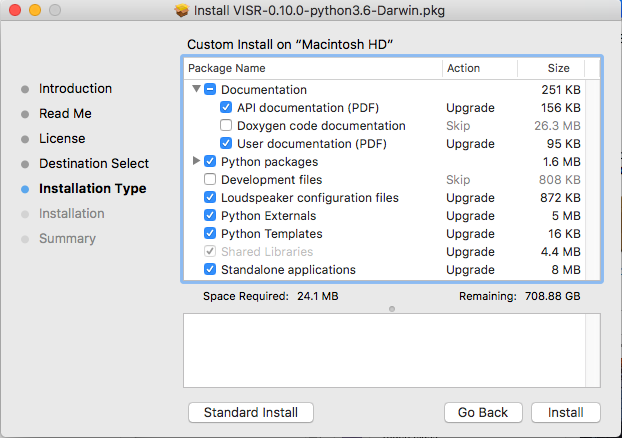 The directory of the resulting file path should be <visr-installation-dir>/python. 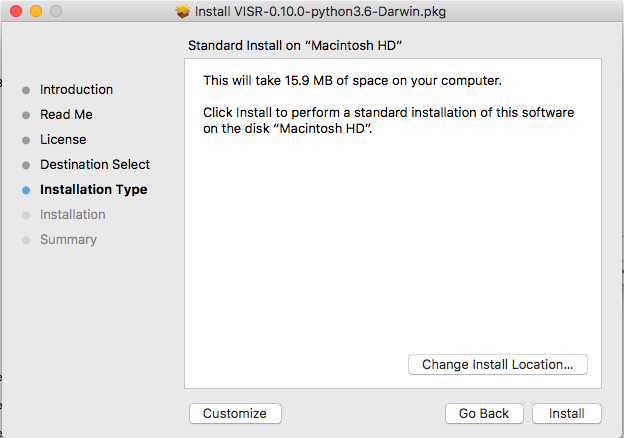 For example, on Windows this returns C:\Program Files\VISR 0.10.0\\python\\visr.pyd.